Digital Voting Machines: Still FUBAR?? Twelve years after Bush v. Gore, bad technology could still wipe out your vote. Update, November 6, 2012 (Election Day): At least one touch-screen voting machine in Pennsylvania was taken out of service because it was flipping votes for Obama to Romney. This November, 25 percent of voters will cast ballots on digital voting machines that won’t leave a verifiable paper trail. 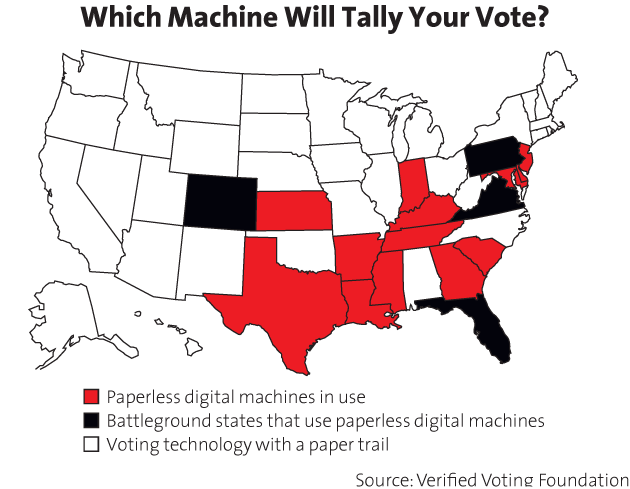 Paperless voting machines are in use in four battleground states that account for 71 of the 270 electoral votes it takes to win. What happens when paperless voting machines fail? 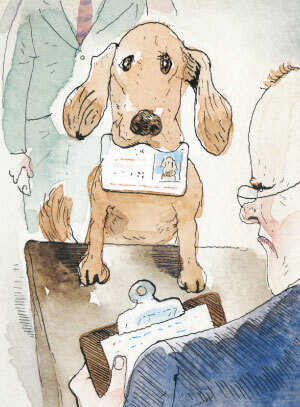 Best case: Election results are delayed by a few hours or days. Worst case: The machine over- or undercounts votes, and there’s no way to verify the tally. According to the Brennan Center for Justice, such failures have caused the miscount or loss of anywhere from a few dozen to tens of thousands of votes in nine states. In 2006, the touch-screen iVotronic system in Florida’s Sarasota County recorded 13 percent of the 140,000 votes cast as blanks. What Happens When Digital Voting Machines Fail? Weren’t digital voting machines supposed to prevent these kinds of mistakes? Yes. The 2000 Florida recount catalyzed federal lawmakers to pass the Help America Vote Act in 2002. hava set aside some $4 billion to replace old punch card machines with digital ones. But there was little quality control as counties scrambled to deploy the new machines. Correction: The original version of this story stated that Douglas Jones is the author of Broken Ballots; he coauthored the book with Barbara Simons.